There's no single 'best' thread for patchwork, quilting, and applique, but there are many threads that are excellent choices for beginning quilters who aren't quite sure which threads to buy. Walk into a quilt shop or explore threads online and you'll find that the choices seem endless. Thousands of thread colors are just the beginning, and possibly the easiest aspect of choosing threads. Beyond that, you'll find threads designed for many different tasks. Threads that work best for sewing patchwork are usually not labeled for that purpose, making selection a bit confusing. Hand quilting threads have characteristics that make them unsuitable for machine quilting. Threads designed for machine embroidery and other decorative techniques are varied and are often not a good choice for assembling patchwork. Use this guide to quilting threads to help you understand the types of threads that quilters use most often. Cotton thread is created by spinning cotton fibers together and then pulling and twisting a narrow strand of yarn away from the mass. Individual strands of the narrow yarn, each called a ply, can be twisted together to create a stronger thread. Polyester, a synthetic product, can be spun together in a similar way to create threads that look like cotton but have more stretch. Polyester can also be drawn out into long, continuous filament threads. The polyester thread may, over time, cut through the cotton fabric and cause damage. It generally takes many years for the damage to occur, but we do see it in some quilts made during the 1970s and 1980s. Another type of thread is made with a polyester core encased in cotton, resulting in a slightly stretchy thread, but with a traditional look and feel. To improve longevity, most quilters who sew their quilts with cotton fabric prefer to use all-cotton threads for the majority of projects. Decorative threads are most popular for wallhangings and show quilts. Always choose a thread that provides the look you want to achieve. All-cotton threads are readily available and are the best choice for piecing our quilting fabrics. Help avoid future wear at the seams by choosing a thread that's no stronger than the fabric. That means it's best to avoid polyester threads and overly strong cotton threads. A hefty thread can also affect seam allowances and accuracy because it takes up too much space in the seam and causes excess bunching. The threads below are all good choices for patchwork, but so are many others. Use my list as a starting point, but be sure to ask staff members at your local quilt shops for their recommendations. Aurifil - An almost lint-free 50 weight thread. YLI Select - A 40/2 thread made from Egyptian cotton. Gutermann Cotton - A 50 weight cotton thread. 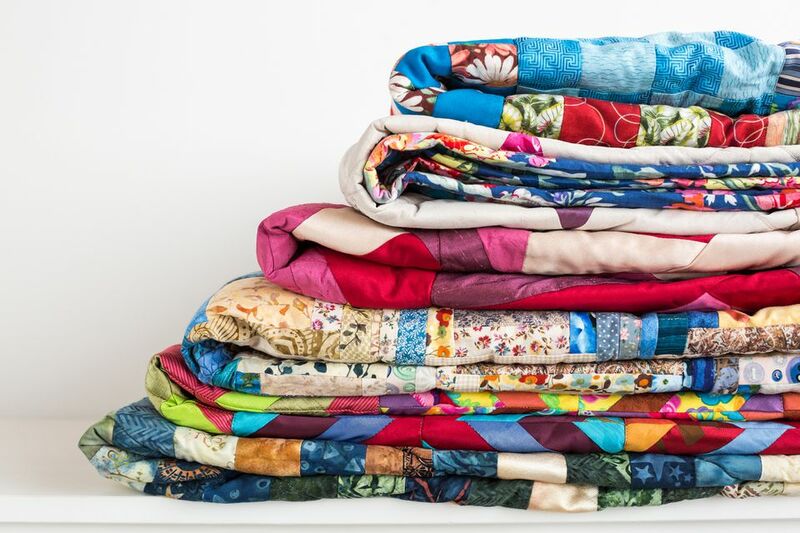 Quilters use all sorts of threads for quilting, from cotton to decorative versions. Threads developed specifically for hand quilting should not be used in your sewing machine because they are coated with a glaze that is not machine-compatible. Beyond that, the sky's the limit. Manufacturer websites are a good source of information for threads suitable for hand and machine quilting. Do keep in mind that you must often change your sewing machine's tension when you machine quilt, use a different thread in the bobbin and choose hand and machine needles that will deliver the thread intact, without damage to its integrity. Rayon is derived from cellulose but is not classified as a natural fiber because the transformation requires quite a bit of manipulation. 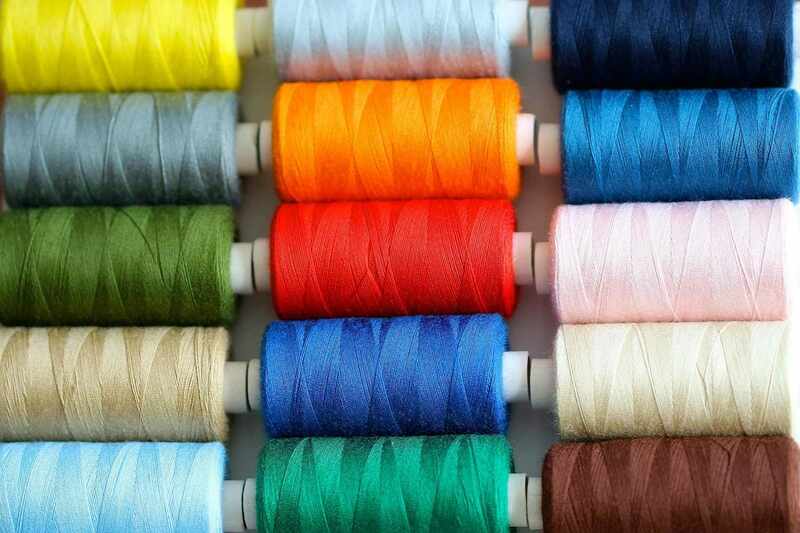 Colorful rayon threads are very popular with quilters and are typically used for machine embroidery and other decorative work. Rayon thread is not used to sew patchwork. Nylon is a synthetic product used to make transparent monofilament thread (one ply), which becomes fairly invisible when used for machine quilting. It can melt under an iron, it sometimes discolors, and often becomes brittle with age. A fine transparent polyester thread is a more durable choice. Metallic threads are typically made from a core of nylon or polyester that's covered with a decorative product. Quality metallic threads also have an outer coating to help protect the delicate metallic layer. You'll encounter threads made from other natural materials, including wool and silk. Wool threads are typically thicker than other threads and sometimes used to embellish a Folk Art quilt or project with a homespun look. Silk threads are sometimes used for applique―they are fine and make stitches that seem to disappear. Silk threads are also a good choice when beads are added to the fabric. Water-soluble threads dissolve when a project is washed. They are used for basting, or for any task where temporary stitches are needed. Fusible threads are used to sew a typical seam, but when pressed they stick the sewn fabrics together. Binding and applique are two possible uses for fusible threads. You'll find other specialty threads when you explore thread manufacturer websites. Unfortunately, there is no single system used to describe thread sizes. One common size designation is depicted as a fraction, such as 50/3. The first number reveals the thread's weight and the second tells us the number of plies― a 50/3 thread has a weight of 50 and is made with 3 plies of yarn. With this system, thread weight decreases as weight numbers increase. A 50/3 thread is commonly used for piecing, but other equivalent sizes work just as well. Another sizing system indicates only thread weight. Sizing systems are complex, and often inaccurate as threads that are imported and exported around the world are re-labeled for a new country. Choose threads based on recommendations from manufacturers, other quilters, and your own experience. Mercerized: Cotton thread is processed with chemicals that give it more luster, improve its strength and help it retain dyes. The process also makes thread fuzzier, which is reduced by putting it through a gassing or singing process. Crocking occurs when dye on the surface of dry thread (or fabric) rubs off onto other materials. Denier: A sizing method that's often used for continuous filament threads. The number indicates the weight in grams of 9,000 meters of the thread. Decorative threads (for hand and machine embroidery and for machine quilting) include the rayon and metallic threads mentioned above. One way to preview these threads is to browse manufacturer websites. Take some time to explore the sites―most have educational resources to help you choose threads, and they often suggest appropriate sewing needles and other supplies that are required for specific jobs. Entire books can be written about thread and its uses, and thread selections are constantly expanding. Ask questions about thread―your local quilt guild and staff at quilt shops are excellent resources. Don't hesitate to experiment with thread, because experimentation is one of the best ways to learn about any product. Once you have sewn with several different threads, you'll have a much better feel for future selections. Disclosure: This article contains e-commerce links, and we may receive compensation in connection with your purchase of products via links on this page. What Is Patchwork and How Is It Used? When Can You Ditch the Binding and Opt for Knife Edges, Instead?